Is deep blue the new black this fall? Obviously dark polishes are always a big hit this season, but I've been especially loving colour family lately. I'm drawn to the air of mystery and sophistication around midnight blues. At any rate, I've been loving the Avon Speed Dry in Twilight Blue*. I received it a few weeks ago & I knew immediately that I would love the colour on (and I do). I have not tried many Avon polishes in the past -- come to think of it, I've only tried one other. I really like the formulation of this Speed Dry polish. It's just the way I like my nail polishes -- not too fluid, but also not goopy. I'm sure the saturated colour was a factor, but I was able to apply one coat for opacity. No bubbles, no streaks. In the bottle there's a soft shimmer, but I don't notice it on the nail. It also tried very quick. As the name suggests, it dried to the touch within 30 seconds. It's definitely a polish that I would pull out for a no-fuss mani. As for the accent nail, I used the Avon Opal Top Coat in Opalescence*. This reminds me a lot Essie Shine of the Times, but there is a suble difference. 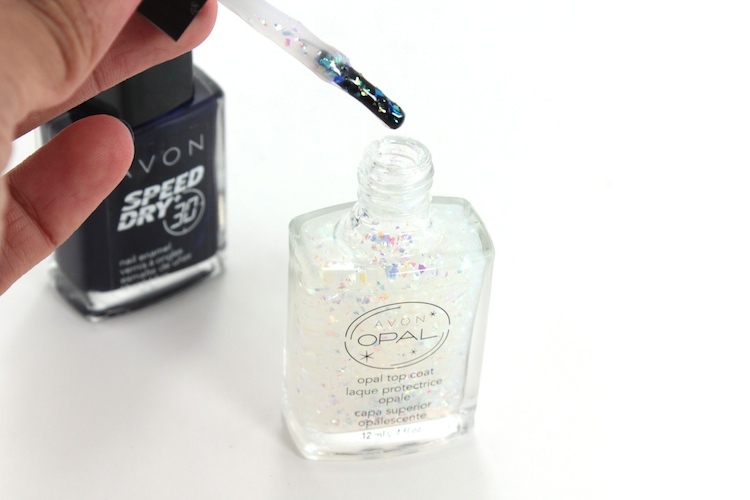 The Avon Opal Top Coat's flakes are a bit more jagged and chunky. There's also a hint of blue to the flakes (they almost remind me of the iridescence you'd find in fish scales -- you know, the pretty ones ;). I love how the Opal Top Coat looks over the dark base. It really brings out the blue in the polish. I haven't tried to take off the polish yet, so I don't know if it stains the nails or not. Hopefully it doesn't. That's my only pet peeve about navy polishes, like Essie Midnight Cami, they always seem to stain. I love this set too!!! the opal looks really pretty!